Federal Government has promised to assist the farming community of North East Internally Displaced Persons (IDPs) at the IDPs Beans Market in Auta-Baliffe, Karu, Nasarawa State. The IDP farmers market is a community of IDPs of about 21 farming clusters in Nasarawa and Kaduna states; producing agricultural goods including beans, maize, millet, groundnuts, soya beans, sesame, and more. 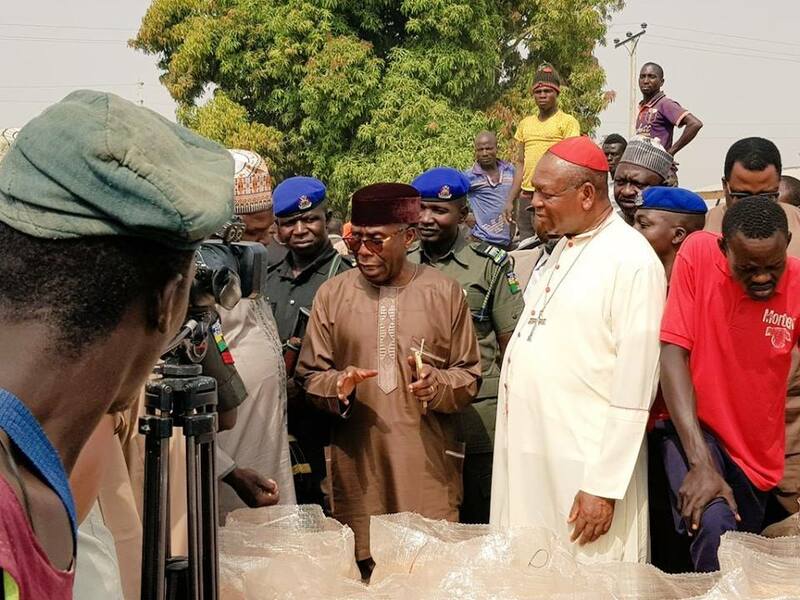 Minister of Agriculture and Rural Development, Mr Audu Ogbeh, during a visit to the IDP camp with the Catholic Archbishop of Abuja, John Cardinal Onaiyekan, said he was impressed with what he saw. Mr Ogbeh said he embarked on the visit to inspect the farming activities of the IDPs and their markets with a view to identifying areas of need for appropriate government interventions. He praised the efforts of the IDP farmers and pledged government’s support to sustain their livelihoods and their contribution to national food security. “I am surprised and elated by what we have seen here today. On behalf of Mr President, we are very proud of you. “We are proud of you because this is not what we normally see at IDP camps. Instead of waiting for someone to bring you food, here you are producing food and making money. “We are going to create a bigger market for you; we will look into the all challenges you are facing here and we see how we can help to enable you continue this business and hopefully, one day return to your homes,” he added. The Minister also used to opportunity to sensitize the IDP farmers and traders on proper and safe storage of their farm produce and on the danger of preserving food with harmful chemicals. Mr Ogbeh thanked Mr Onaiyekan for his interest in the welfare of the IDPs; and appreciated the Governor of Nasarawa State and the Etsu Karu for accommodating them in their territory. Some of the challenges highlighted by the IDPs farmers and traders include: agricultural machineries, farm inputs, storage facility, water and sanitation facilities, extension services, and means of farm transportation. “We are Internally Displaced Persons, displaced from our humble abode in our farming communities in North Eastern Nigeria but we refused to be aggregated in an IDP camp to wait for government and NGOs for support. “We chose to remain productive and independent and do the little we can to be of value addition to national growth through agricultural productivity and job creation, the market chairman, Mr Sunday Wabba, told the delegation.